What Am I Inspired By Today? I'm inspired by the autumn sunshine pouring down and warming the earth. I'm inspired by the unconditional love my boyfriend has for me. 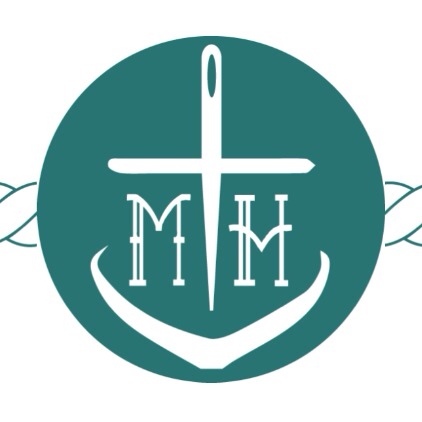 I'm inspired by the community of knitters and crafters and fiber artists that I network with everyday over Instagram, Facebook, Ravelry and other nooks of the internet. I'm inspired by the anticipation of going to San Diego soon and to be by the ocean (Please let there be some beach knitting time!). I'm inspired by the half finished sweater sitting in my knitting bag next to me patiently waiting for sleeves. I'm inspired by the people who say they'll miss me when my temp job is over. I'm inspired by myself because of how many jobs I've been applying for and for not being discouraged when I am ignored (45+ jobs in the past three months). I'm sitting here at work this morning, coffee in hand, thinking about last weekend. I'm going through Facebook posts on the health benefits of knitting. I'm looking at pictures of gorgeous hand-dyed yarns, and also looking through a book of gardens, most of which are California gardens. And you know what? It's kind of hard not to tear up. Why do I feel so emotional over this hobby of mine? Is it just a hobby? I know I'd love for it to be my career path. Why am I so emotional over wanting to move? I know it's probably because it's been my dream goal for at least three years. Also, I'm itching to move...maybe it's a job hunting day. I'm looking up articles on how to start designing knitting patterns. What sort of inspiration can I find to invoke a design? What sort of shapes can I make? What colors should I use? Today is just one of those days where you feel like everything is going right. I feel productive at work, doing work things, not just feeling like I'm slacking off working on my own things (not that that's a problem, but, you know, I ought to be working while I'm at work). I hope this continues on through the weekend. What is inspiring you? What is making you feel good? Here I was thinking I wasn't going to have anything inspiring for you today. How wrong I was. I found this article called "What I Wish I Knew About Creativity When I Was 20." Well, I'm 23, so I'm not that far off, but it was still some great advice. I'm going to let you all know now that I won't be posting again until Tuesday. Friday is a half day at work, and then that afternoon/evening, the boyfriend and I will be heading down to Tombstone, AZ to do some reenacting, namely The Gunfight at the OK Corral. This is my first reenacting escapade...we'll see if more follow. I hope you all have a fun and safe and relaxing Labor Day weekend! Wow! I got a notification last night that my views were a lot higher than normal. That just made me want to blog more and get something out! The numbers themselves are inspiring. I did notice Merlin getting a lot of attention. He's usually one of the first things I show people when I'm talking about my art. Merlin alone is an inspiration to me...because I want to continue making felted taxidermy. It's a process though, as is anything anymore. My felting supplies and taxidermy forms are in my storage unit from when I moved...and they're high up...and there's a million things in front of the tower of boxes that I need to get to. See, I had a plan to only put boxes I needed access to on a certain side of the unit so that I could get to them if I needed something out of them. They were either clearly labeled or the boxes were clear so I could see exactly what is inside. And then when it came down to the deadline of when I needed to be out of the apartment, everything just kind of got thrown in. Whoops. But it's even more incentive for me to find a job in San Diego and a new apartment/house and to move. Job, move, Megan can get to her boxes, Megan can make more felted taxidermy. Speaking of jobs, I'm working another temp job for 12 weeks. I started last week, and it's going well, but I don't understand how people do this. Call me lazy (and/or negative), but all I want to do is sleep at this point. I don't know how some people work 40+ hours and then maintain a social life post work. I can understand being able to do it if it was a job you absolutely loved. I can totally see myself working in the studio for over 40 hours a week (what is it, "Choose a job you love, you'll never work a day in your life"? Yeah, that one). But right now, if I try to go do anything with Dylan after work, I usually end up passing out before I can get through one episode of whatever TV show we've chosen to watch. I'm hoping that at some point I can catch up a little. The nice thing is that I have been able to knit a little during the downtime. Usually I'm pretty busy with phone calls and social media updates, but sometimes I can squeeze in a couple rows. I should make it a personal requirement if I'm expected to work. "Hi, sorry, I have to do this, it's for my therapy so I don't kill anyone today." Coffee and knitting: My two things to get me through the day without killing anyone. Speaking of working and doing what you love, I found this article last week titled 8 Things People of Our Generation Don't Understand (and Really Need To) About the Working World. Check it out; 8 is my favorite and kind of reiterates what I said above. I wish I had been able to write and post something yesterday. I think maybe this weekend I need to do a knitting round up so I have some progress things to show you next Wednesday. Here's a little inspiration for you directly from me! How to make my Project Bags! Basic sewing rules apply...you ought to iron your seams, but I usually don't for my project bags. I know, I'm bad...just like how I don't knit swatches. But I always clip my threads! Keep things nice and tidy! 1. To start off, lay out your fabric, but keep it folded on one edge. Cut the long side to be 34" and the short side to be 15". I try to use a rotary cutter and ruler to cut the fabric, but I have also taken the route of just measuring and ripping the fabric. Either way works. 2. Next, with right sides together, pin and sew a 5/8" seam up the long side of your fabric. 3. After you have sewn your long seam, fold the fabric in half, so that the 15" ends meet. You should have a 17"x15" square of fabric. Pin the corners together so everything is even. Sew a 1/4" seam along the 15" bottom fold. So, now you have a bottom to your bag! 4. At this point, you are able to turn your bag inside out so that both the outside and inside of the bag have the right side of the fabric facing outward. Also, this is the step where you need to decide which side will be the outside of your fabric. If you have a definite direction the pattern on your fabric goes, you will want to have that side on the inside of the bag for now while you are finishing it. 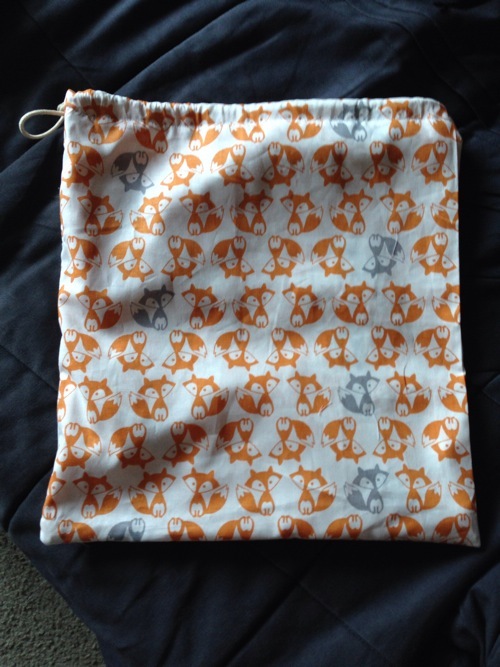 For example, on this particular fabric, I chose the side with the most right side up grey foxes to be the outside. I then turned the bag inside out so the wrong side/inside was on the outside. 5. With the wrong/inside on the outside of your bag, match and pin the unfinished edges together, seam to seam, edge to edge. Sew 1/4" along the edge. You can see the seam is between the two pins here. 6. Time to hem the top. Fold over the edge 1/4" on the stitch line and pin. 7. Sew a zig-zag stitch over the fold at 1/4". 8. Fold the edge over 1" and pin. Sew a straight stitch over the edge. I tried to keep the bottom of the hem against the left side of the foot. 9. Tada! You have made your bag! Turn the bag inside out again. This is what the outside top of your bag should look like. 10. At the top of the side seam of the bag, do a little reinforcing. This is so that when you are pulling your bag closed later, the entire seam doesn't rip. 11. Below your reinforced stitch, use a seam ripper to cut the threads at the seam. 12. With your cord or ribbon, take the safety pin and put it through the end of your cord or ribbon. Start threading it through the top hem of your bag. This part is a little tricky and is usually the part that I have the most difficulty with. Sometimes it's hard to get the safety pin out the other side once you have threaded the cord all the way around. Basically, you just have to keep working with it until it eventually comes out. Also, I've found that the thicker the fabric you use, the more difficult it is to pull the cord through. 13. Once you have threaded the cord or ribbon through all the way, remove the safety pin and knot the ends together. 14. One end will look a little rattier than the other due to it being pulled on by the safety pin. Go ahead and clip the ends so that they're even and look nice. 15. Put the Fray Check on the cut ends so that...the ends don't fray! Let the Fray Check dry before using your bag. I'm playing around with adding a clip to the edge so that you might clip the bag onto something else while you're working, or it you were working on something on the go. Stay tuned! I hope this tutorial was clear and helpful. If you have any questions, please don't hesitate to comment or contact me. Also, I would love to see your bags when you make them! Enjoy! I'm not quite just what to write about today. It's been a busy week already. I had my first temp job yesterday, and though I was only sitting and answering phones, I was EXHAUSTED by the end of the day. How do people to that 5 days a week? Anyway, let me see if I have anything saved around the interwebs to share with you today... I saw some photos of sculptures done by Beth Cavener Stitcher. She is one of my favorite artists. I thought this was kinda cool. I didn't know that this taxidermy diorama existed at KU. I'm always going to love taxidermy...my favorite museum is the International Wildlife Museum near Tucson. Squid ring. I want one in silver, please! Alright, well, I hope you enjoy those little snippets. More tomorrow, hopefully! For this week's Inspiration Thursday, I wanted to share an artist that I admire quite a bit: Rachel of Cornflower Blue Studio and Flower Moon. I absolutely love her freeform crochet pieces. Many of them remind me so much of the ocean and ocean life...of course I'd be drawn to her work! Please go visit Rachel's blogs Cornflower Blue Studio and Flower Moon for more inspiring photography of her work. Today's Inspiration Thursday is going to be a little different. I want you to check out this blog post from The Textile Blog on an exhibition called Pattern to Print. Click the link, or the image below! Enjoy and be inspired! So, how else am I suppose to start this first Inspiration Thursday without a picture of the ocean?! Commence obligatory ocean image. I plan to make this more organized in the future with more links and images...probably more like a "stuff you guys might like" post with more fibery things and whatnot. I'm sure it'll evolve. But thanks for checking it out this week! See you all tomorrow for Casual Friday!